The comfort of a Luxury B&B in downtown Venice, the refined style of a boutique hotel, the quality services of a 4-star hotel. 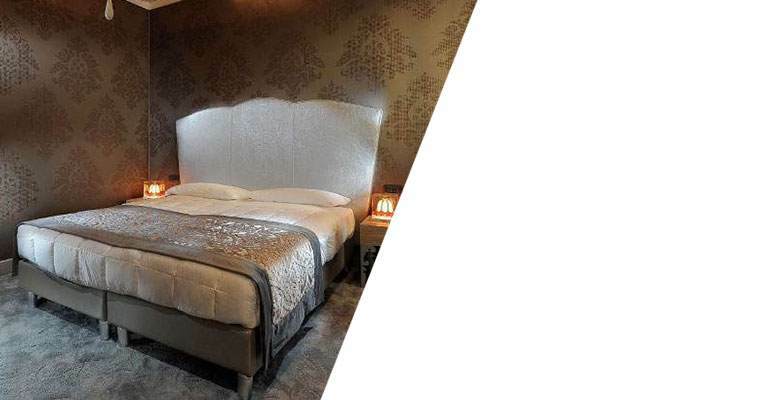 Aqua B Luxury House Venice is an exclusive bed & breakfast , located just a few mintues away from Piazza San Marco and Rialto, in a hidden alleyway in the beautiful district of Castello – the ideal choice for a romantic weekend or for a family vacation in Venice. In an enchanting timeless location, the charming B&B Aqua B has splendid rooms and suites perfected even in the tiniest of details, with saught-after furnishings and all modern amenities. 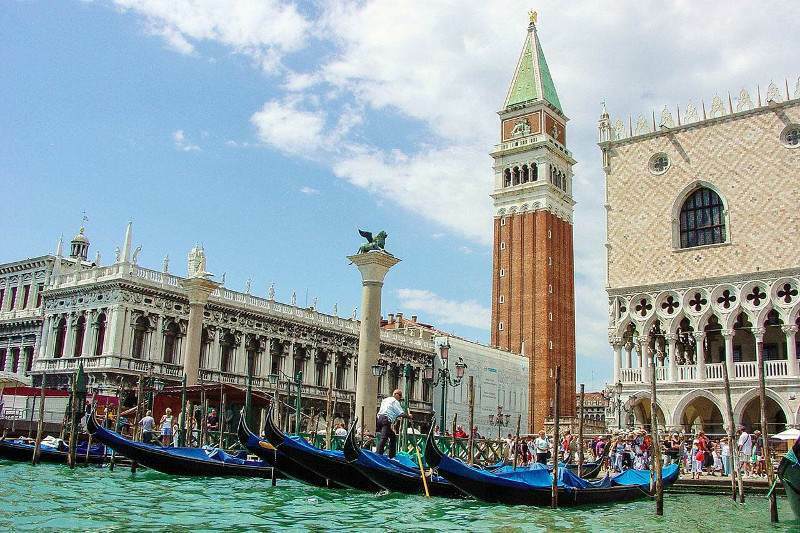 For your vacation in Venice, treat yourself to the best. Let yourself be captivated by the unique charm of the Aqua B. From the International Airport, ‘Marco Polo’ of Venice you can reach Piazzale Roma with a taxi, with ACTV bus number 5 or with one of the ATVO suburban buses. From Piazzale Roma, take ferryboat line 2 and follow the directions under the section, ‘By train’. You can also reach Aqua B with a water taxi (25 minute ride) or with the Alilaguna ferryboat (orange line) that will take you to Rialto in 60 minutes. From here turn left towards Rialto, then take the first right onto Calle Larga Mazzini. Follow the directions as stated under ‘By train’. From the Venezia ‘Santa Lucia’ trainstation take ferryboat line 2 for Rialto. Once you get off the ferryboat, turn right and then immediately left onto calle larga Mazzini. After about 70 meters, turn left onto Marzaria 2 Aprile. Walk for another 50 meters, turn right onto Calle dei Stagneri (Disney store), cross the bridge and you’ll be right in front of the Chiesa di Santa Maria della Fava. Keep to the right, onto Ramo Licini where you will find the B&B Aqua B. From highway A4, exit at the Venezia Mestre tollbooth and follow the directions for Venezia – Piazzale Roma, car terminal. Leave your car in one of the multilevel parking areas and take ferryboat line 2. Then follow the directions stated in the previous paragraphs. In Venice, the B&B Aqua B is located in Ramo Licini, in the historic district of Castello, just a few minutes away from Piazza San Marco, in an area away from the hustle and bustle of tourists and surrounded by a timeless atmosphere, adding a bit of charm and romance to your holiday. By plane | From the International Airport, ‘Marco Polo’ of Venice you can reach Piazzale Roma with a taxi, with ACTV bus number 5 or with one of the ATVO suburban buses. From Piazzale Roma, take ferryboat line 2 and follow the directions under the section, ‘By train’. You can also reach Aqua B with a water taxi (25 minute ride) or with the Alilaguna ferryboat (orange line) that will take you to Rialto in 60 minutes. From here turn left towards Rialto, then take the first right onto Calle Larga Mazzini. Follow the directions as stated under ‘By train’. By train | From the Venezia ‘Santa Lucia’ trainstation take ferryboat line 2 for Rialto. Once you get off the ferryboat, turn right and then immediately left onto calle larga Mazzini. After about 70 meters, turn left onto Marzaria 2 Aprile. Walk for another 50 meters, turn right onto Calle dei Stagneri (Disney store), cross the bridge and you’ll be right in front of the Chiesa di Santa Maria della Fava. Keep to the right, onto Ramo Licini where you will find the B&B Aqua B. By car | From highway A4, exit at the Venezia Mestre tollbooth and follow the directions for Venezia – Piazzale Roma, car terminal. Leave your car in one of the multilevel parking areas and take ferryboat line 2. Then follow the directions stated in the previous paragraphs. Since the B&B is close to the ferryboat stops it is a great starting point to visit the wonders of Venice, sailing along the Canal Grande amongst historic buildings, towards the most famous destinations such as Palazzo Grassi, the Gallerie dell’Accademia (Venice Academy), the Fondazione Guggenheim (Guggenheim Foundation) and the Casino. From the bed & breakfast, a pleasant stroll will take you to the Basilica of San Marco and to Palazzo Ducale, two beautiful buildings that embellish the already splendid Piazza San Marco. Sit at one of the tables of its many coffee shops and enjoy a drink in a romantic and unforgettable atmosphere. From the square, the walk along le Mercerie is a great chance to stop and do a little shopping, while you head towards Rialto and its market. 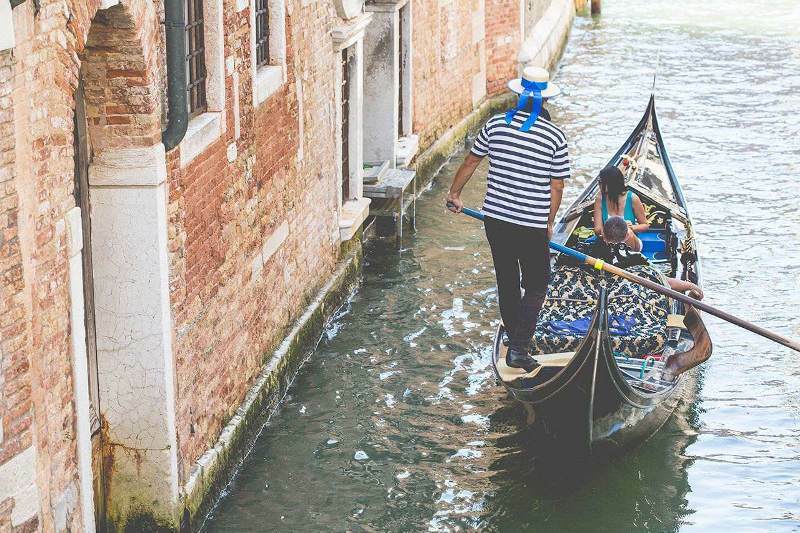 Here, in addition to the famous bridge, you will find different bacari – traditional taverns that serve the classic spritz, always accompanied by a cicheto, an irresistible Venetian snack made of fish. The B&B Aqua B is also conveniently located to reach the Museum of Ca’ Rezzonico, the La Fenice Theater, the Lido of Venice, the Mostra del Cinema (Film Festival), the location of the Biennale d’Arte (Art Exhibition) at the Giardini and the beautiful Riva delle Zattere. The rooms of the B&B Aqua B are intimate love nests for those who wish to spend a romantic and unforgettable vacation in Venice. Their amenities and services can be compared to the ones of some of the best 4 star hotels. Elegant furniture, luxury finishes and splendid marble bathrooms, turn the rooms and suites into dream rooms, quiet and relaxing, filled with charm and characterized by a seductive and exclusive style. A few of the rooms have wooden-beam ceilings but all have soft lighting, wi-fi,adjustable air conditioning, flat-screen satellite TV , bathroom with shower and courtesy kit. Breakfast is served in your room from 7:00 a.m. to 10:30 a.m. 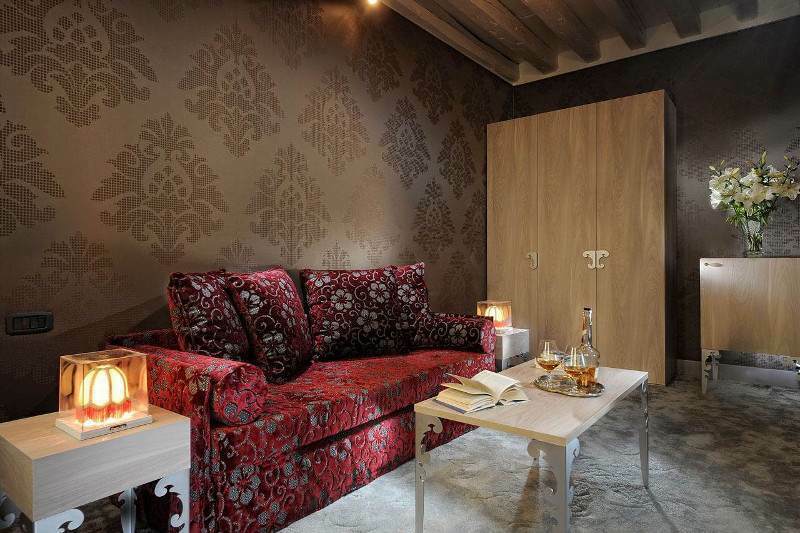 Elegant and comfortable double rooms for an unforgettable vacation in the heart of Venice. With all amenities, luxury furniture and elegant finishes. Complete with all amenities, exclusive and elegant Junior Suite for an unforgettable stay in Venice. Large area with two rooms: master bedroom and small living room with a couch. Also for three guests. 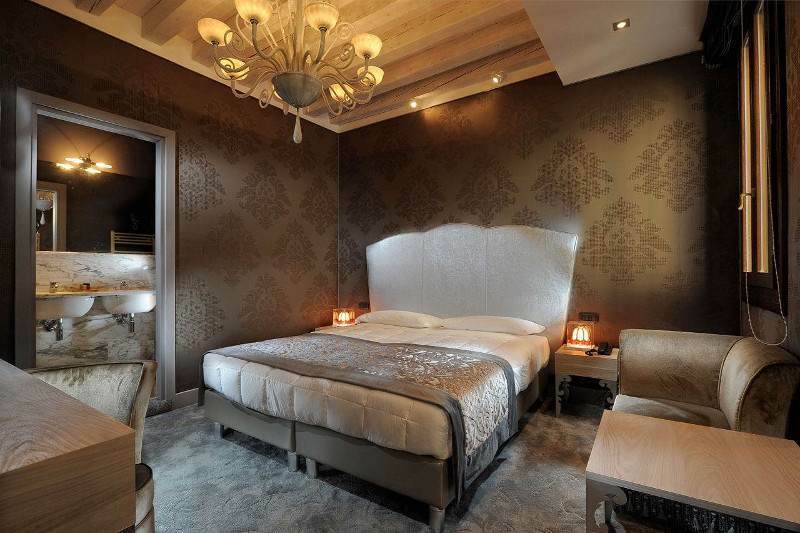 Exclusive Suite for a luxurious stay in the center of Venice. Large, elegant and equipped with all the best amenities, it features a master bedroom and a small living room with a couch. Up to four guests.